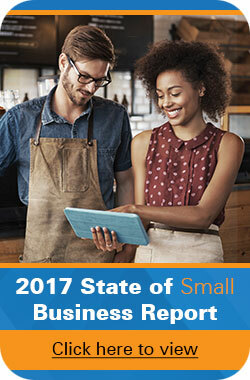 If you ask a SMB owner the most common response to the question is that they just don’t have the time or resources. Furthermore, when owners do take the step across the social media border, they are confused about what constitutes social media. Is social media just platforms Facebook, Twitter and LinkedIn, or does email marketing, newsletters and post card blizts count as well? While there is some debate about what the definition should embody, many gurus and experts confess that both strategies should be employed together. One is not as successful without the other. Below are some tips to follow when beginning the social media climb. Forget for a minute whether you want to use social media platforms for ROI, Calls to Action, lead generation, brand recognition and so on. Start small and expand. Once you’ve correlated efforts you can decide what outcome you wish to create. 1. Create a business profile on Twitter, LinkedIn, Facebook and Google+. Don’t mix your personal and business profiles. Each platform should have a description of your business, how to contact you, a photo of your name or brand and link to every other social platform you inhabit. This is an example of a company Facebook page. 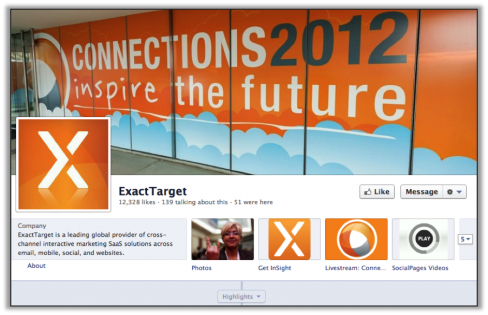 ExactTarget provides cross channel interactive marketing, and in order to promote their brand they have utilized the Facebook banner, their photo, the about us portion as well as updating items like photos, live streams and videos. 2. Measure the variables by experimenting with social media tools. There are a variety of social media tools such as Tweetstats, measures the amount of tweets according to whatever metric you put in; Google Analytics, allows you to target specific keywords when writing marketing content; FollowerWonk, use to observe the “following trends” of you and your competitors, with the display of a venn diagram. 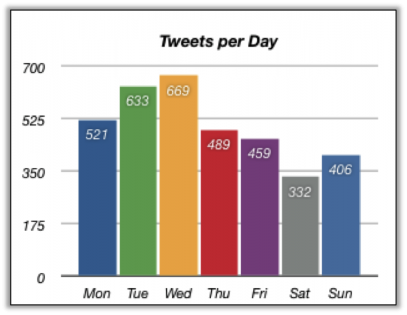 Tweetstats can provide the amount of tweets send over a month, week, day or year, as well as your tweet timeline and engagement. 3. Consider what apps, plugins and widget would benefit you. Web-based applications are programs that are designed for use within your browser (Safari, Chrome, Firefox), for example, SkyClerk, Salesforce and WordPress. Plugins are software modules that add to the functionality of an application, like WordPress plugins, Adbobe Reader and QuickTime. And widgets are mini applications that can add functionality to your web page, blog, social profile, etc. This is a list of widgets you can add (there are millions more). People can click on them to interact, for example, if users want to follow your blog through an RSS feed, they can click on the orange widget labeled “Blog/Feed”. Every blog you write will automatically go to their RSS feed list. 4. Align your blog with your social strategy. Think of your blog as the center of the wheel and your social media platforms as the spokes. Each spoke should lead back to the blog. This is where your widgets come into play. Adding RSS feed options, and social media widgets to your website, blog, and within each platform. Users can automatically follow every platform your on. It’s like a one stop shop for users. Slingshot SEO provides SEO consulting services. Slingshot’s blog says its slogan above, the title of the blog and a list of social media platforms in which it engages. The easy access encourages users to tweet the current blog, follow Slingshot, like them on Facebook, Google+ the post, pin it and share it. This is the most effective way to join a conversation. 5. Develop a marketing strategy specific to the media being used. Whether you are deploying a social media strategy or an email marketing one, you need to send the appropriate message. Social media demands two-way interaction. You can’t just send a tweet and move on, you must monitor trends, jump into dialogues, re-tweet and reach out to others. Newsletters on the other hand, only require composing outbound information. Are there any other social media tips that help your SMB stay above the competition?